While fishing off the Long Beach pier, Harry Hamilton, a visitor from Prince Edwards Island, Nova Scotia, made a spectacular catch, which required a hard and frenzied battle to drag the creature from its briny home up to pier-level. It was only after subduing the finny fellow that Hamilton realized that his valuables–$325 in cash, a ticket home, and a diamond ring–were no longer in his pocket. It is unknown if his property fell into the water while Hamilton was preoccupied with his catch, or were they snatched by a pickpocket, but the sad fact remains that Harry Hamilton, who was this morning well equipped to enjoy his stay in Fiesta-time Los Angeles, now possesses just his luggage and a large fish. Anyone who wishes to buy said fish may contact Hamilton c/o this website. The Padrone must run a tight ship. Juan Acosta is a Padrone. He has a shotgun. Just east of the city, at the Bixby Ranch, he discharged four men from one of his tents for reasons unmentioned. These gentlemen returned before daybreak and one of them, a Juan Diaz, stabbed a sleeping Acosta through the arm, and then stuck him in the breastbone and forehead. Acosta still managed to grab his shotgun and unload onto Diaz’ abdomen at point-blank range. El Padrone’s brother managed to tackle and hogtie another assailant, one Luciano Morro, who was found bound at the entrance of the tent by local Marshals. The two others, Mssrs. Bartello and Rodriquez, now have warrants out for their arrest. Padrone Acosta is expected to pull through. The outlook for Diaz is not as rosy. 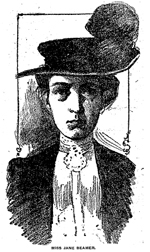 Pity Miss Jane Beamer of Long Beach, who for most of her 20 years has yearned to meet her father, from whom her mother separated when she was tiny, back in Beamerville, IL. She has discovered to her great grief that the fruit and confectionary vendor killed Tuesday night near his shop at 708 East Fifth Street was this same Frank O. Beamer, who has been living in this community for a number of years. Many times had Jane Beamer, her mother and her step-father R.E. Blair passed Beamer’s stand, and even gazed into his face, without recognize the ladies’ kinsman, who was also Blair’s schoolyard chum. Today, Miss Beamer grieves at the Bresee Brothers’ mortuary on South Figueroa Street, lending comfort to Beamer’s widow, who did not know until today of her husband’s previous marriage or child. The accident occured when Beamer stepped off an East-bound Brooklyn Avenue streetcar at the intersection of Fifth and Ruth Avenue. As he alit, his path was crossed by an automobile driven by W.P. Young, carrying three ladies and R.H. Ingram, general superintendent of the Southern Pacific Railroad, en route to catch the San Francisco Owl train at the Arcade Depot. Beamer, who was very nearsighted, was apparently startled to see the machine so near him, and moved first one way, then another, before dashing headlong into the path of the oncoming auto. Although Young killed his engine and attempted to swerve, Beamer was struck and killed where he stood. The inquest found Young without fault after Beamer died in the Emergency Hospital without regaining consciousness. 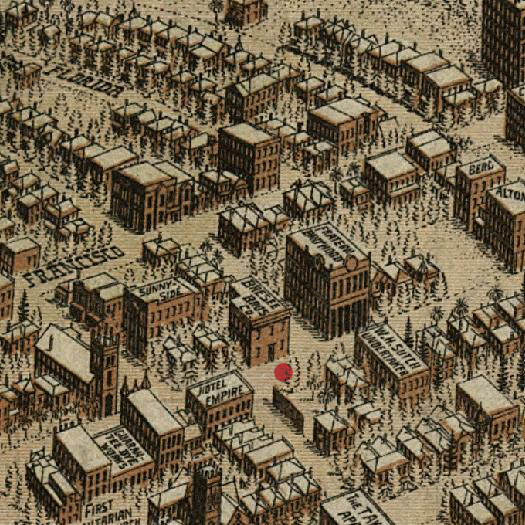 Illustration below from the 1909 city map compiled by Worthington Gates, Western Litho Co, showing Bresee Bros in the heart of Mortuary Row, on Figueroa just south of Eight Street.